I recently upgraded to Windows 8 from Win 7 64 bit and have started to encounter a strange issue. When I have any program running which plays sound, such as a game or spotify, after a random interval (usually around 5-10 minutes) the program sound will set itself really low. If I Alt-Tab to the desktop and check the Mixer I can see that the Application volume has automatically set itself really low - the other volume levels (i.e. the Device speakers) stay the same. I'm able to just set the application volume back to a reasonable level and it stays that way for another 5 - 10 minutes then goes quiet again. My sound is Realtek High Definition Audio and my machine is an Acer Aspire 5738G if that helps in any way. 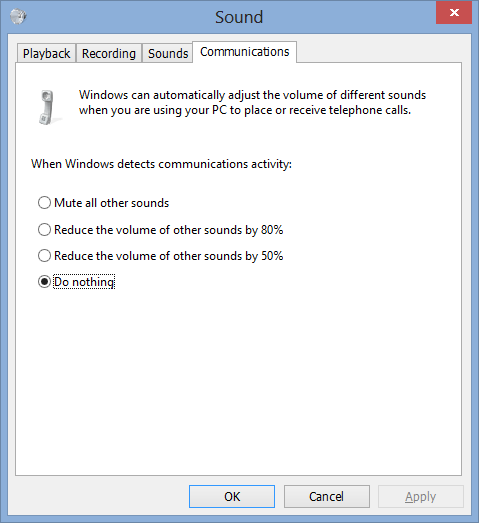 This is often caused by Windows thinking (often incorrectly) you are running an application that uses a microphone/telephony, and lowers other sounds for you. In the Start menu, search in the Settings category (Win+W)for "Change Sound Card Settings". In the Communications tab, change "When Windows detects communications activity" to Do nothing. Similar to mtone and danijar, I had this issue with a something that was modifying the volume in an attempt to keep it constant. It was a program called "Dolby Digital Plus" which has an option called "Volume Leveler". I opted to turn the whole program off tho - problem solved! I did notice lots of my music had very different volumes, but I go through them and change their volume as I come across them. Not the answer you're looking for? Browse other questions tagged windows-8 audio volume-mixer mixer or ask your own question. Why do my Stereo Mix levels keep reverting to 50%? How can I automatically lower Spotify playback volume when my Video Editing program makes a sound? Why is the volume mixer showing no sound?